We’ve always found it valuable to learn about other cultures. I love it and my girls love it. They’re learning about the different corners of the world. They see people’s differences and celebrate them. We chose China this time because Chinese New Year was happening soon (today actually), but an exploration of another country can happen at anytime. Choose two or three activities from this list. Find a couple of books at your library (or Internet resources). And then, have fun learning about another country together. It’s an incredibly valuable experience. You can start with these fun China activities for kids. 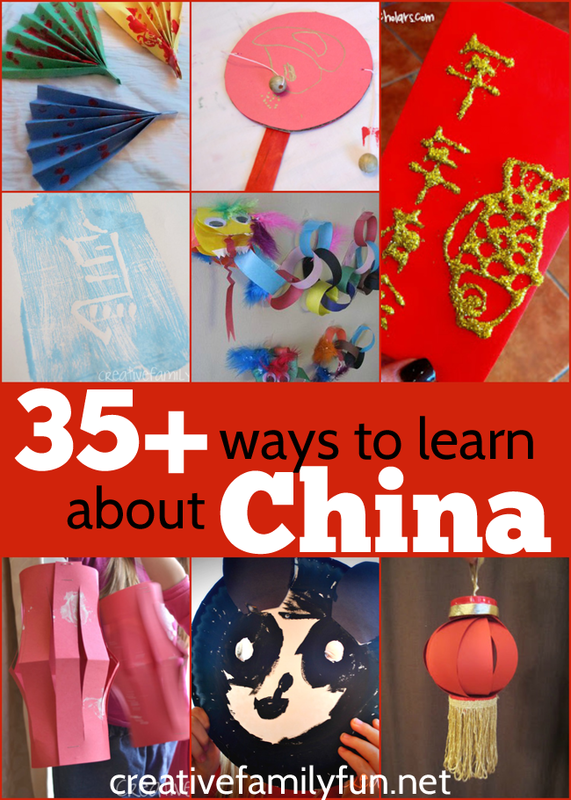 Here are over 35 fun China activities for kids including crafts, food, books and art projects. It’s so much fun learning about a different culture together. 1. Make round folding fans for Chinese New Year with Naturally Educational. 2. Join in at Marie’s Pastiche and find out the top 10 things to do for Chinese New Year. 3. Make Chinese New Year Dragon puppets with Red Ted Art. 4. Make Chinese New Year Dragons from paper loop chains with Naturally Educational. 5. Make stunning Chinese New Year lanterns with Relentlessly Fun Deceptively Educational. 6. Make red envelopes for Chinese New Year with Sun Scholars. 7. Enjoy a Chinese tea ceremony and read book about Chinese New Year with Little Wonders’ Days. 8. Make Chinese rattle-drums with Creative Family Fun. 9. Make a Chinese zodiac poster with KidWorldCitizen. 10. This year will be the Year of the Horse. Learn to write the Chinese character for horse and turn it into a beautiful piece of art with Artchoo. 12. Make a Giant Panda lapbook at Homeschool Share. 13. Read one of these books about pandas at Fantastic Fun and Learning. 14. Make paper plate panda masks with Creative Family Fun. 15. Make shaving cream marbled tigers at Play Create Explore. 16. Make paper plate tiger masks with Creative Family Fun. 17. Make Peanut Sauce and Rice Noodles with Inner Child Food. 18. Make Honey Sesame Chicken with Lil’ Luna. 19. Make Chinese almond cookies with Table for Two. 20. Make vegetarian dumplings with Spoonful. 22. Make cherry blossom folding fans with In the Playroom. 23. Decorate with Chinese lantern fairy lights with Red Ted Art. 24. Make a cultural book about China with Kids Activities Blog. 25. Make Chinese dragon paintings with Use Your Coloured Pencils. 26. Make a simple kite craft with Creative Family Fun. 27. Make a paint and paste Chinese Dragon Craft with No Time For Flashcards. 28. Create Chinese-style scroll painting with Use Your Coloured Pencils. 29. Learn to draw Chinese lanterns with Art Projects for Kids. 30. Learn about Chinese characters while exploring the art of printmaking with Creative Family Fun. 31. Make a bamboo scroll from craft sticks with Marie’s Pastiche. 32. Make cupcake liner fortune cookies with JDaniel4’s Mom. 33. Make straw-painted paper lanterns with Creative Family Fun. 34. Make a Chinese gong with KidWorldCitizen. 35. Choose from 14 books about the Chinese New Year at Gift of Curiosity. 36. Read one of these 10 books about China at No Time For Flashcards. 37. Read one of these Chinese Folktales for Kids at What Do We Do All Day? 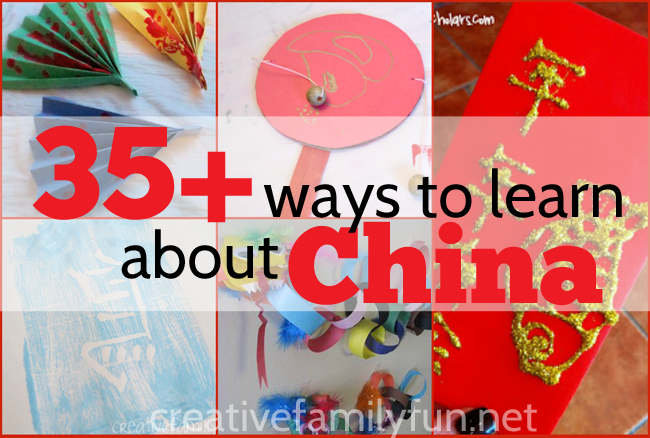 Have fun learning with these China activities for kids!